During the past two hundred years, Western countries have experienced an unprecedented increase in living standards, globalization has deepened the connections of people around the world, and the plight of the poor hasbecome more noticeable to the average person. This relatively new affluence and awareness helped expand local acts of compassion into the modern humanitarian movement where charity expanded globally. The modern humanitarian movement, which began in the early 19th century, was almost exclusively religious in nature, and was primarily a tool for conversion and a way for religious organizations to fulfill their notions of good work. As the 19th century waned, many religious organizations “began to downplay their interest in conversion in favor of improving the lives of the local peoples; they became less reliant on ‘the good book’ and more reliant on the public health manual” (4). By the middle part of the 20th century, Western governments became the primary funders of humanitarian action. Secular humanitarian agencies were favored while religious humanitarian agencies began minimizing their religious identification and purpose. This trend of secularization receded somewhat in the early 1980’s and the last few decades have seen “a very healthy expansion” of religious agencies in the humanitarian space, mainly dominated by Christian and Islamic aid agencies (5). Sacred Aid: Faith and Humanitarianism explores the tensions between secularization and sanctification of modern humanitarianism. The authors analyze “the structures and everyday acts of aid agencies and other actors that create, sustain, and dissolve” the differences of the religious and secular worlds (9). 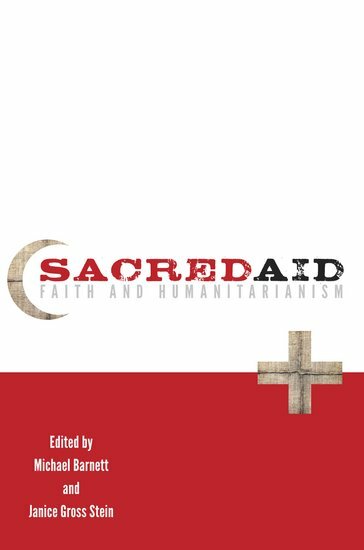 In this academic pursuit, the authors of Sacred Aid ask important questions such as whether the increased professionalism of humanitarianism will lessen the sacred mission of humanitarianism, how and why humanitarian organizations, both secular and religious, brand themselves to donors and recipients, and whether secular or religious humanitarian organizations will be better able to adapt to future political trends in humanitarianism. In Sacred Aid’s introductory chapter, Michael Barnett and Janice Gross Stein describe the rise, decline, and rise again of faith-based organizations (FBOs) in humanitarian work as well as provide the reader with some important definitions. The authors write that humanitarianism is marked by three characteristics. First, humanitarianism must be organized and part of governance. Second, humanitarianism must connect the “immanent from the transcendent” (14). Lastly, humanitarianism must be directed at those in other countries, thus distinguishing humanitarianism from local acts of charity. Barnett and Stein argue that over time, humanitarianism has become more professional, with an increased attention to fundraising, branding, and bureaucracy. At the same time, the boundaries between religion and secularism have blurred, resulting in the secularization and sanctification of humanitarianism where “the sacred can exist within secularism itself” (18). The secularization of humanitarianism is “the process by which elements of the everyday and the profane insinuate themselves and become more integrated into humanitarianism, thus challenging its sacred standing” while the sanctification of humanitarianism is the “creation of the sacred, establishment, and protection of a space that is viewed as pure and separate from the profane” (8). As the humanitarian space becomes more competitive, this tension becomes more important. For this reason, the authors note that there are strategic reasons humanitarian organizations may want to identify as religious or secular and yet associate themselves with the other group. After the introductory chapter, the main arguments of the book can be broken into three distinct sections. Chapters 2, 4, and 6 analyze how humanitarian organizations fundraise and distribute humanitarian aid. Chapters 3, 5, and 7 show how spirituality influences aid-giving practices. The last two chapters ask how humanitarianism operates in “an age of bureaucracy” (chapter 8) and how the gap between the secular and spiritual can be “bridged” in humanitarian work (chapter 9). The following summary is organized according to the three sections of the book, starting with the chapters analyzing fundraising. In chapter two, Hopgood and Vinjamuri analyze the branding choices humanitarian aid agencies make as they compete for the limited amount of public and private monies available to fund their humanitarian activities. The authors persuasively argue humanitarian organizations, both secular and religious, operate in “an increasingly competitive market” where “every potential donor can now find a product close to what it ideally wishes to fund” (58). Humanitarian organizations act like firms in a competitive industry, except that rather than maximizing profit, humanitarian organizations “raise revenue to fund relief and development operations” and instead of selling a good or service they provide aid (39). This competition “shapes the strategies pursued by faith-based and secular humanitarian groups” (37). Central to Hopgood and Vinjamuri’s analysis is the branding choices humanitarian organizations make. Branding is important because the two sources of humanitarian funding, public and private, “often create conflicting incentives for humanitarians,” especially for “faith-based organizations (FBOs) that must be careful not to undermine their private religious identity when seeking public funds from secular donors” (37-38). However, when FBOs successfully balance the conflicting incentives, they receive “a market position superior potentially to that of their secular competitors” (38) because they are able to access public funds while also securing private funds, which are generally more stable. Using the notion that humanitarian organizations must compete for donations, in chapter four Ajaz Ahmed Khan analyzes the motivations of charitable giving and the expectations donors had when giving to Islamic Relief Worldwide (Islamic Relief), a Muslim international relief and development charity. Khan finds that donors gave because of religious obligation, because they felt the charity promoted a positive image of Muslims, and because of “strong altruistic motivations and a desire to alleviate the poverty and suffering of others” (90). Building from the branding discussion in chapter two, Khan notes that Islamic Relief balances its perception as an Islamic charity while also sharing secular humanitarian aims. This balance became especially important after the attacks of September 11, which increased the suspicions of many in the West towards Islamic charities. In order to combat these suspicions and protect its secular funding, Islamic Relief stressed “the humanitarian and impartial nature of the organization” and “emphasized development expertise rather than religious commitments” (93). In order to protect its private funding from donors, many of who are Islamic and attracted to Islamic Relief because of its Muslim standing, Islamic Relief made “frequent references to the Qur’an and hadith in its promotional literature and websites” (91). This religious facet also built higher levels of trust between Islamic Relief and its donors on how donations were spent. Chapter six is the last chapter analyzing humanitarian giving. In this chapter, Erica Bornstein discusses the segregation of religious and humanitarian charity in India and how the segregation was codified, specifically highlighting the role of Hindu giving. Bornstein notes that the Hindu giving of Dān, a donation that does not require a return in this lifetime, is common in India. When the British colonized India, they did not legislate “customs,” of which Dān was considered. Following this tradition, in the late 1800’s, British common law defined charitable giving in such a way that excluded Dān because it was given to a specific person rather than towards the public benefit. Giving for public benefit was considered humanitarian charity while giving towards a specific person was not. This decision codified into law the distinction between different types of giving in India and helps explain why “tax laws that regulate the work of humanitarian organizations are much stricter for secular organizations than for religious ones” (157). Bornstein argues that this legal distinction is important because “religious charity is significant in terms of size and social scope…is also relatively ungoverned” and is “untouched by the secular state” (152). This legal arrangement has “lead to repeated attempts to regulate religious donation” (157). However, the author writes that additional regulation may be “an impossibility, particularly given the sacred nature of gupt dān (anonymous donation) and the spontaneity with which most religious giving in India takes place” (158). Chapter three is the first of three chapters exploring how spirituality affects aid-giving practices. In this chapter, Jonathan Benthall explores “cultural proximity,” or the notion that “commonality between an aid program’s implementers and its beneficiaries can be regarded as giving the implementing agency (or its principal representatives) an operational advantage” (65). Benthall focuses his analysis to the Islamic world, specifically the Indonesian province of Aceh and the country of Mali. In both regions, the author confirms “the thesis that Islamic NGOs can, on occasion, benefit from a privileged relationship with beneficiaries in Muslim countries” (74). Additionally, while acknowledging the scarce amount of research analyzing “cultural proximity” and Christian humanitarian groups, Benthall writes that “the advantages to Christian NGOs of ‘cultural proximity'” appear “beyond dispute” (68). “Cultural proximity” is important to how religious humanitarian agencies are viewed by beneficiaries in two essential ways. First, “the discourse of religion is more familiar to most populations” (20) than the language of secular humanitarian groups. Second, religious groups generally have a strong local network through which it can coordinate its activities (the Catholic Church is an example) when aid is needed quickly whereas secular groups do not. These characteristics give religious humanitarian groups an advantage over secular humanitarian groups. However, Benthall caveats this finding in two ways. First, charities engaging in large-scale proselytism may have more difficulty in areas where their religious views are different than the religious views of the beneficiaries. Second, secular organizations may be seen as more credible because they are committed to universal principles such as helping the poor, regardless of the religious preferences of the beneficiaries. In chapter five, Walker et al. explore the relationship between spirituality and well-being during humanitarian crises and in traumatic environments. Noting that the Universal Declaration of Human Rights asserts the right to live with dignity and that spirituality is a core value to most people, the authors examine “how humanitarian aid agencies interact with the spiritual lives of their beneficiaries and how spirituality within some agencies may determine how and where they provide aid” (115). They also analyze if supporting spirituality would promote recovery and survival in times of crises. The author’s results are threefold. First, they find strong evidence that spirituality positively influences health outcomes after trauma and stress. They write that there is a “strong correlation between the strength of someone’s faith and the speed and completeness of their recovery from trauma” (123). Secondly, faith plays a role in how aid workers cope with the stress and danger of their work. Lastly, FBOs “believe that faith makes a positive difference in their ability to program effective aid” (132), giving them an advantage over secular agencies. These results lead the authors to believe “there is a strong case to be made for the critical role supporting faith can have in improving survival and recovery from the trauma of a major humanitarian crisis.” (132). Much like Benthall, the authors caveat their findings. First, most of the research examining the link between spirituality and well-being has focused on Protestant Christian denominations in North America and Europe. The authors question whether the results would be different under different faith structures. Second, the authors lament the paucity of research measuring how faith helps aid workers, writing that the “evidence linking spirituality and aid workers is thin and largely in the form of anecdotes” (130). Recognizing these weaknesses, Walker et al. conclude their chapter by outlining four additional areas of research that would clarify the role spirituality has in overcoming trauma and humanitarian crises. Chapter seven is the last chapter analyzing spirituality and aid-giving practices. In this chapter, Bertrand Taithe notes that while most humanitarian work was initially conducted by missionaries, the humanitarian field has become more competitive over time. This competition has made it important for humanitarian organizations to distinguish themselves and has increased the importance of modernization of humanitarian delivery. Taithe also “explores how technical know-how and faith could be combined” (168). In this pursuit, Taithe concentrates on French Catholic missionary intervention in the colonial and postcolonial era and asks whether the modernization and secularization of aid agencies is a positive trend. As an example, Taithe highlights the transition of Catholic medical missionary work in Cameroon into Ad Lucem, the second largest provider of health care in Cameroon. While this transition represents a successful adaptation of modernization, Taithe cautions that such a victory may be pyrrhic if the modernization crowds out the sacred principles of the work. Taithe argues that FBOs and missionaries have two fundamental advantages over secular humanitarian organizations. First, while FBOs may work towards other objectives, conversion is their primary goal. Generally, FBOs have been able to use their religious identity and mission as “an effective marketing device” which “gives them access to a built-in constituency” (28). In contrast, the rationale of secular organizations is not always clear and this lack of clarity may be seen by beneficiaries as political. Second, FBOs and missionaries are a more permanent fixture. Taithe notes that “in a competitive marketplace, missionaries have always played the long game” and “in the moving feast of UN and NGO workers descending onto one field or another; time poverty is a challenge to secular NGOs but not to missionaries and their associated FBOs and micro-FBOs” (181). Whereas secular organizations are more likely to move from place to place, missionaries and FBO’s “have had a concrete and demonstrable record of ‘indigenation'” (181). These two reasons may explain why religious organizations may have an easier time communicating with local populations. The last two chapters of the book bring the reader back to the discussion in the introduction: how does the sacred and secular coexist in humanitarianism. In chapter eight, Michael Barnett asks whether the sacred can exist in humanitarian work during an age of increased modernization. Barnett explains that the increased rationalization and pragmatism in humanitarianism is largely due to “a crisis of faith in the humanitarian sector,” specifically the failures of humanitarian organizations in Rwanda in 1994 (190). This increased professionalism emphasizes the “immanent rather than the transcendental” (190). Barnett concludes his chapter by asking whether religious or secular organizations can best maintain the sacred in humanitarian aid. He argues that religious organizations may be better equipped because they “more closely monitor whether techniques are crowding out religious values” (205). Still, Barnett writes that “the humanitarian sector was awash with the ‘sacred’ during the good old days of humanitarianism” but “from the vantage point of the vulnerable, it left a lot to be desired” (208). Therefore, secular organizations and professionalism will always have their place in humanitarianism. In the final chapter of the book, Paras and Stein advance two arguments. First, the authors argue that there is not a clear dividing line between secular and religious organizations because “humanitarian space and human rights embody the sacred for both secular and religious humanitarians and are sanctified by both” (209). The authors argue that there are three broad implications stemming from this point. First, the idea that religious identity contributes to the success and legitimacy of humanitarian organizations is oversold. Second, what organizations sanctify matters because it helps maintain the moral community of the organization. Lastly, once an organization determines what is sacred, the next most prominent challenge is navigating how to operate within the different authority structures humanitarian organizations face. The second argument of Para and Stein is that religious humanitarians are “better prepared to navigate the boundaries between the sacred and the profane than are secular humanitarians” (209). Religious humanitarians, unlike secular humanitarians can “draw on deeply embedded traditions” (231). The authors provide an optimistic view that the professionalization of the humanitarian sector does not automatically remove the sacred and that the two can peacefully and fruitfully coexist. Sacred Aid: Faith and Humanitarianism provides a scholarly and systematic treatment of the changing landscape of humanitarianism and the important interconnections between the sacred and secular and religious and secular humanitarian organizations. As the humanitarian space becomes more competitive and if FBOs continue to increase in number, the analysis in Sacred Aid will only increase in importance. The book’s greatest strength is its unique scope. The authors did not restrict themselves to analyzing the humanitarian space through material lenses but expanded the scholarly focus to the spiritual dimensions of humanitarianism. As stressed in chapter five, spirituality positively influences health outcomes after trauma and stress, exactly the areas where humanitarian aid is targeted. Had the authors only stressed the material benefits of humanitarian aid, their analysis would have been lacking and less significant. The book’s second strength is its depth. The research is well sourced and readers who want a more in-depth analysis are given the resources to pursue such an inquiry. This depth also allows the authors to add caveats to their arguments, providing a refreshing balance to the book. This balance opens the possibility for a fruitful future dialogue regarding the secularization and sanctification of humanitarianism. Despite the impressive contribution of Sacred Aid, the book contains some weaknesses. First, while the introductory chapter is informative and fascinating in its own right, it wanders and at times enters into an esoteric discussion not needed for a reader to understand most of the chapters. The authors spill a lot of ink dissecting different definitions of religion, the sacred, and the secular where a much shorter discussion would have been more effective. A second weakness, at least for some readers, is the definition of religion used in the book. The editors of the book choose to use such a broad definition of religion that many readers will find it unsatisfying. In Sacred Aid, religion is essentially any belief system that is “capable of maintaining itself in the ever-present face of chaos” (14). Since the rest of the book analyzes specific mainstream religions such as Christianity, Islam, Judaism, and Hinduism, the fuzzy definition of religion seems ill-placed. Like many edited books, the most glaring weakness is its organization. Chapters 2, 4, and 6 follow naturally from each other as do chapters 3, 5, and 7 and yet the book separates the natural flow. While superb in some areas, the introductory chapter does an insufficient job in guiding the reader through each chapters’ arguments or the natural flow of the book. The authors of Sacred Aid: Faith and Humanitarianism use scholarly tools to analyze the intertwining of secular and religious trends in humanitarian work. Given the increased role FBOs play in the humanitarian space, Sacred Aid is a welcomed addition to the aid literature. While there is much research to be done, this book serves as a good first step to understand the changing nature of humanitarianism. The book is highly recommended for scholars, humanitarian workers, and policymakers interested in understanding the intersection of religion and humanitarian work. Sacred Aid is also a must read for anyone who teaches classes in economic development, non-profit studies, or foreign aid.